I wake up to the monotonous drumming of rain. How relaxing, how peaceful,- after all that early morning drilling and hammering in Shanghai,- and I lull back to sleep. 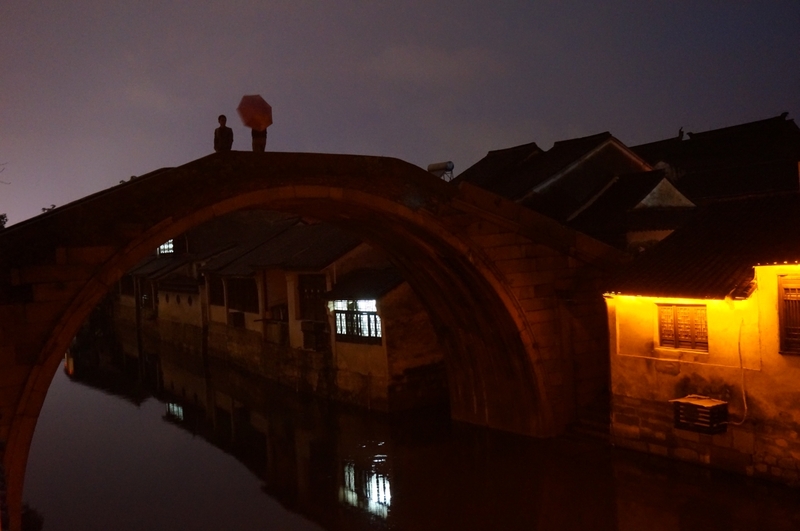 Suddenly I open my eyes widely: We are in the ancient water town of Nanxun. And it rains! It is like that old episode of the Pink Panther, where Pink is followed by a rain cloud. No matter where he goes, it keeps raining but only on him; Pink tries to escape, but the raining cloud is persistent. It seems, our rain cloud has been following us the whole way since Shanghai, at times catching up with the speed of our tandem, and now it stays with us for good. Yesterday, when the cloud caught up with us in Shanpu, I took the kids in a rented car for the last 20 km, and we arrived in an old guesthouse right at the bank of the canal. The spacious wooden lobby was decorated with calligraphy scrolls and paintings, a bookshelf boasted a small library on the history and culture of Nanxun. In another shelf was stuck a pile of Chinese paper with calligraphies: the hotel owner, Manager Zhu, originally from Shanghai, practiced calligraphy in his free time. He grimly predicted that the next day would be even colder – less than 10°C and raining. But then I opened our window over the canal, and looked at the stone bridge arching to the left, at another one to the front, and at the wooden bridge to the right, and decided that it is time to catch up with the sightseeing part of our travels, no matter what. And Nanxun surely has what to offer. The water town was established in the 13th century at the crossing of a branch of the Grand Canal with the Shi River. It enormously prospered during the Ming and Qing Dynasty, thanks to the production and trade in raw silk of highest quality. With the help of Manager Zhu’s library I planned the itinerary for the next day: the local Daoist temple established during the Song dynasty (though rebuilt many times after); the lovely garden of the Little Lotus Villa, established by a wealthy Qing official. As a librarian I could not miss the Jiaye library – one of the biggest private libraries in southeast China. Two family compounds – that of the Zhangs and of the Lius,- both built in the late Qing, were also on the list, for they uniquely combined traditional Chinese architecture with European one. And of course, the huge Mansion of 100 Rooms, dating 400 years back, which was built by a wealthy Ming official to supposedly house his servants. Unfortunately, I didn’t take into account two major factors- the weather, and the kids. In the morning the predictions of our host turned out to be true. I looked out of the window, and on all sides was water – water in the canal under us, water pouring down from the sky. The weather forecasts for early April in this region were between 15°C and 20°C , with 4 rainy days average for the whole month. Accordingly, we had come equipped for warm, relatively dry weather. We huddled in front of the air-conditioning that blasted hot air and waited, and waited for the rain to relent. Close to noon, we gathered enough courage to venture outside for a breakfast, wrapped in half of the contents of our bags and wearing two layers of socks in our open tracking shoes. The beginning was promising: we took the narrow street paralleling the river, flanked by old houses, the dark carved window frames and doors of which stood in picturesque contrast to the whitewashed walls. We walked past several of the ancient stone bridges spanning the canals, among blooming sakura and almost forgot about the rain. Unlike the more famous water towns of Zhouzhuang and Xitang, Nanxun remains out of the normal tourist itineraries and is still not drowned in flashy signs, souvenir shops and noisy tourist crowds. 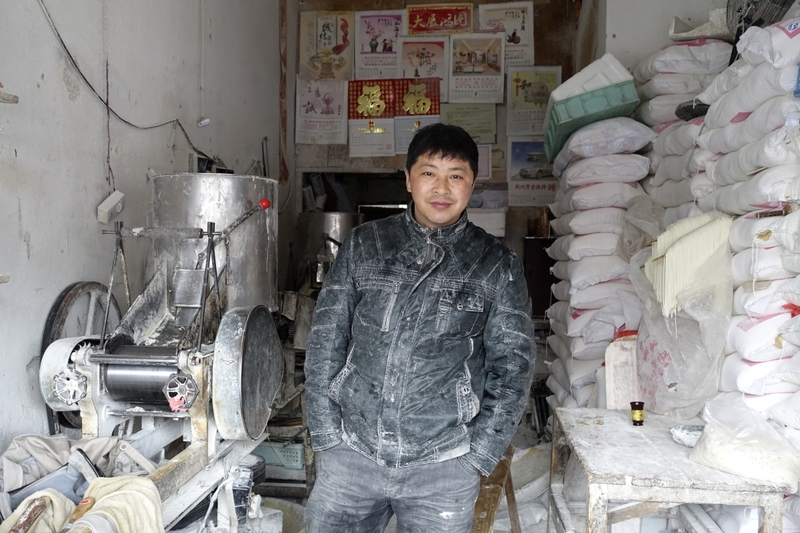 Local families that have lived here for generations still inhabit the same old houses and have their small shops, workshops and eateries on the ground floor. 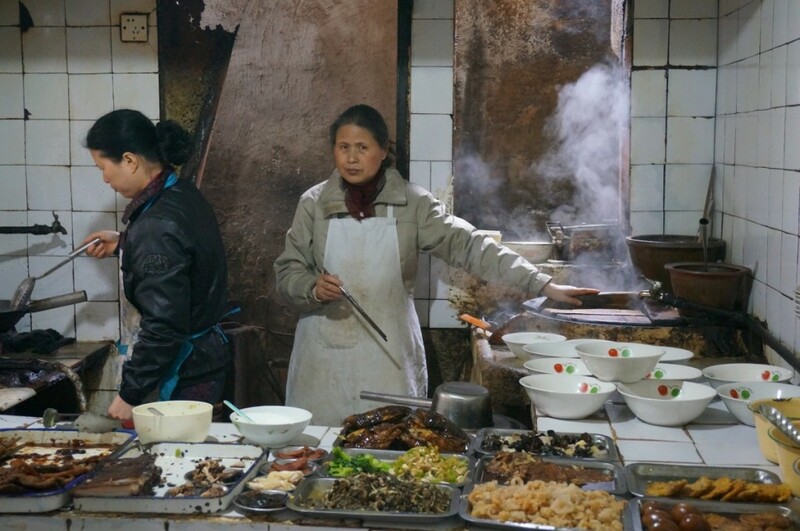 Our first stop was a small noodle shop, with wooden benches and an opened kitchen, where a huge pot for cooking noodles was steaming behind a buffet of cold snacks. We slurped our huntun (dumpling) soups, while Sarah and Nora were mastering the art of eating noodles with chopsticks, among a mixed crowed of locals and a few Chinese tourists. A local granny with her small granddaughter joined us, attracted by the two foreign kids. The usual questions followed: are they twins, do they go to school, do they go to kindergarten. The kids bashfully explored each other from the corners of their eyes, until barter of goodies melted the ice: two corn-sticks for a Easter chocolate butterfly. Both sides found their acquisitions quite tasty. Warmed up from within, we continued on our way: past more local eateries, past a noodle workshop with a noodle-machine, past a liquor shop with big earthen pots containing liquors of different varieties and strength. 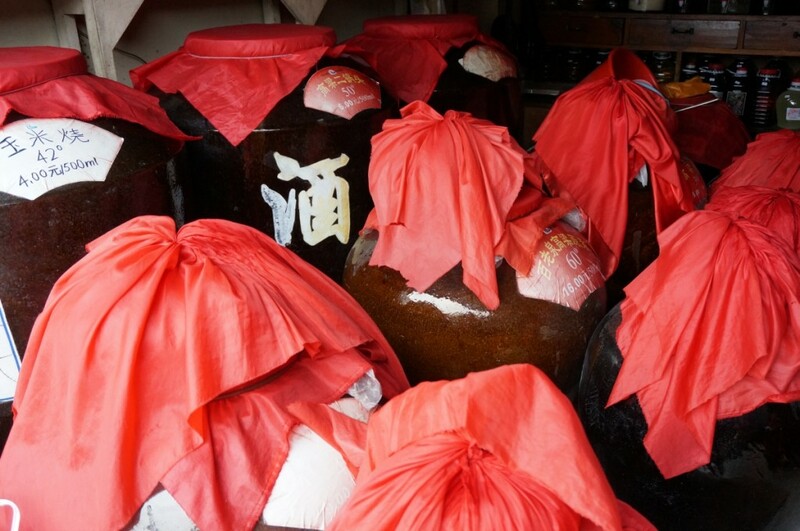 By the time we reached the Daoist temple of the Broad Mercy we could ourselves need some of this liquor to warm up again. Sarah suddenly took interest in the murals in the entrance hall, depicting the protective stellar gods of different animals, arranged according the four directions, and wanted to know their exact names and titles. Try to read with clattering teeth 4 x 7 lofty sounding Daoist titles and translate them into understandable Bulgarian! Again on the street, drenched and with two whimpering kids we found refuge in the first café that appeared on our way. It was full with young Chinese tourists, who were likewise sheltering there from the rain. The big sweet lattes once finished, Volker turned back with Sarah and Nora towards the hotel, while I decided to brave the elements and proceed with the sightseeing schedule. Somehow I reached the Liu Family mansion, hundred meters down the street. I passed through several traditional courtyards with intricately carved windows, not a soul in sight, and suddenly I stepped into a room with plastered ceiling, heavy baroque armchairs and oil paintings on the wall. 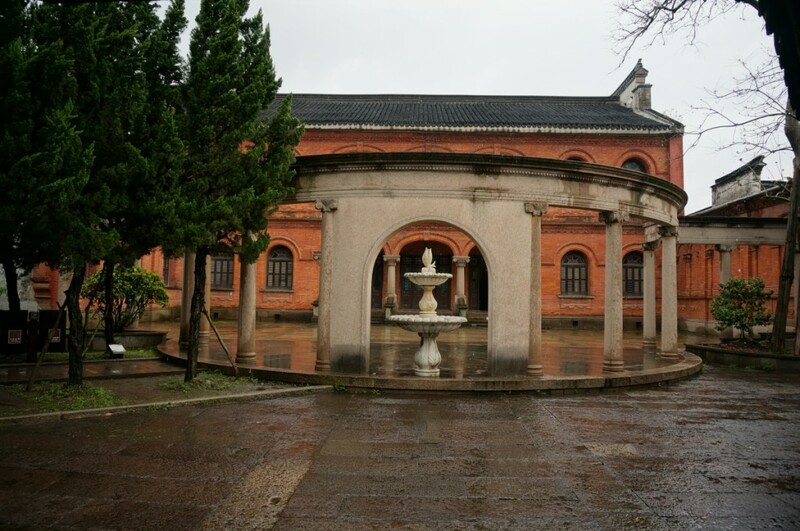 Outside it was even more surreal – one would expect to see the red Romanesque exterior and the colonnade complete with a fountain and cypresses, in Italy, but never in a ancient water town in south-eastern China. The owner – a member of the local richest family, had the materials, including the stained-glass windows, imported from Europe. And then I stood in the entrance again and contemplated – enjoying garden views in a downpour like that is out of the question. The private library is still at some distance, and even if there would be some books displayed, how to concentrate on them when shaking from the cold? The other European-style mansion – that of the wealthy merchant Zhang Shiming, which boasts even a ballroom and wrought-iron balconies, is just across the canal, but I still need to go to the nearest bridge and cross it. My shoes squeak and gush out water with every step, and even the absolutely waterproof jacket starts to succumb to the torrent. At that moment Volker calls – he is back in our warm quarters, and the kids want strawberries, and there is one fruit seller just on the way to our hotel, so, could I buy some when I pass by, please. And this decides it: the vision of the cosy room and the call to provide for the needs of the kids take over the urge to explore the rich local culture. I head back quickly, strawberries in hand. Manager Zhu looks even more frozen and gloomy. His forecast is even grimmer: temperatures further dropping down the next day – a day of biking for us,- and as it comes to rain – nobody knows. I cuddle under the thick blanket in front of the air-conditioning, from which intricate installations of wet shoes and socks are hanged to dry, and let myself be lulled again by the monotonous drumming of the rain. Ich lese täglich und ganz gespannt eure Berichte! Ich drück ganz fest die Daumen, daß die „Wolke über Volker“ sich verzieht und ihr bald schöneres Wetter habt!